Taking a trip to Alaska can be a once in a lifetime experience, and for many, it is just that. Many choose to fly from the lower 48 states up to Alaska for obvious reasons. It is a LONG ways away. Depending on the window of time you have, flying may be the best option. 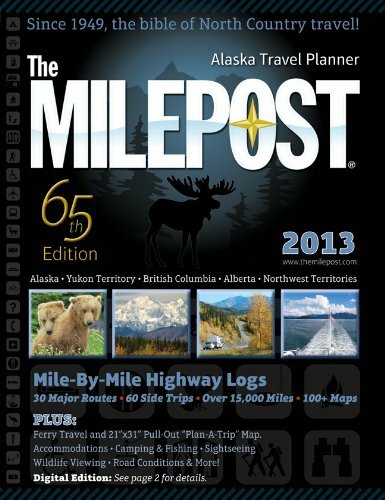 But if you are going to drive to Alaska, there is one essential, must have guide book you need to have, the Milepost. The Milepost is more than a map, or a sight-seeing guide. It is the end all be all guide for Alaska travel planning if you are driving. The Milepost includes everything from highways, roads, recreation, lodging, campgrounds, landmarks, services, attractions, ferry systems and more for every individual mile of drivable road in Alaska, and on the way to Alaska through Canada. Depending on what part of the lower 48 states you are beginning your trip from, there are numerous Canadian provinces that you will drive through. The milepost includes all of the before mentioned info for routes through British Columbia, Alberta, the Northwest Territories and the Yukon. The Milepost has been the most trusted and complete guide for traveling to Alaska for well over half of a century. Even before Alaska became a state in 1959, routes were being planned out from the lower 48 states as early as the 1940’s. World War II played a big role in this because of the threat of Japanese invasion of Alaska, and the need to get supplies up to the then territory. Once a rough passable road was created, there was a need for an in depth travel guide with detailed information about each stretch of road and trail, and in 1949, the first official milepost was born. The first milepost was nothing more than a 72 page guide, weighing no more than 4 ounces, describing around 1000 drivable miles of drivable road through Alaska and Canada. At this time, very little if any of the roads leading to Alaska were in good condition. Most were dirt and gravel. The milepost now includes over 800 pages and dissects all the travel info you could possibly need for over 14,000 miles of paved drivable road through Canada and into Alaska. The Milepost has also expanded to include an in depth section on the Alaska Marine Highway. For those planning on spending part of their trip exploring Southeast Alaska by ferry, there is a section including all season ferry routes and terminals. The most common areas to get on the Marine highway from the Alaskan highway are at Skagway and Haines. The famous “Alaska Highway” actually starts in Dawson Creek, British Columbia. To get to the start of the Alaskan Highway from the Canadian bordering states, you will still need to drive hundreds of miles before just getting to the start. The shortest route, entering Canada from Northern Montana, is at least 800 miles to Dawson Creek, AK, and the milepost will guide you from the start. The Alaska Highway is drivable throughout the entire year, but most tourist travel occurs between May and September.